The First Direct Arena in Leeds has opened to great acclaim, with shows by Elton John, Leonard Cohen and local hero’s The Kaiser Chiefs wowing audiences in this state of the art venue – the first UK arena to open in 13 years. Selected on its strength of performance in other arena venues, Showsec has been entrusted by SMG as the sole event security company for the venue, including the Phones 4u Arena Manchester and Metro Radio Arena Newcastle. Since being awarded the contract in February, Showsec undertook extensive planning working closely with SMG to create an innovative security operation, in line with its ethos of giving a client focused service and delivering an excellent experience to their visitors. Preparation began with a recruitment drive from the Leeds office that saw the numbers of staff doubled from 300 to 600. Showsec focused on recruiting for some dedicated roles that required experienced hospitality people from the hotels, sports and event sectors. Led by Showsec’s head of security for the first direct arena Richard Eliott, teams deployed in the venue across the opening concerts comprised around 30 supervisors, over 150 SIA licensed professionals and 125 stewards. The new staff members were taught the relevant skills to deliver a first class service, as Showsec provided experience working in other arena’s so that they could be mentored and appreciate the expected level of professionalism. During a test event at the arena in July, Showsec was able to monitor crowd flow around the venue, and the practicality of best routes for getting people to their seats. Prior to the venue opening, Showsec held a three hour venue familiarisation programme that was invaluable in achieving the most effective deployment of staff given the unique layout and design of the arena. Having this knowledge in advance was key to giving new staff the confidence and ability to fulfil their roles. 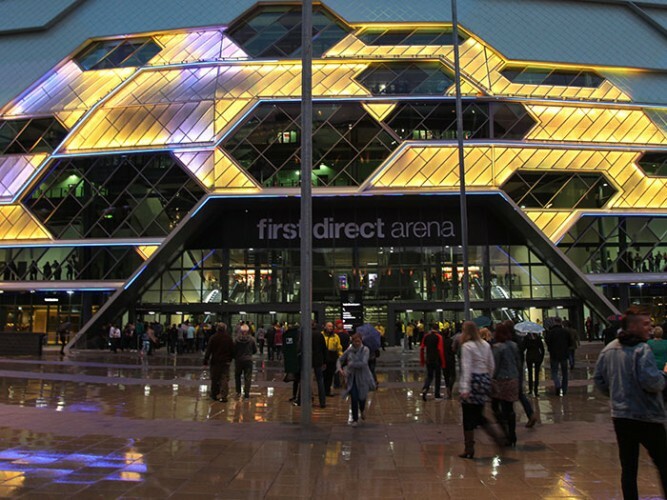 Alan Wallace, regional manager for the north office, said: “SMG has made a great transition into the First Direct Arena; they have transferred the best of their considerable experience into this venue while proactively encouraging new ideas. They have drawn on an excellent support network throughout the industry for many aspects of the arena.